Posted On July 16, 2011 by &filed under Labour & Employment Laws, Legal Articles. The position of India in terms of child labour is not an appreciable one; with a credible estimates ranging from 60 to 115 million, India has the largest number of working children in the world. 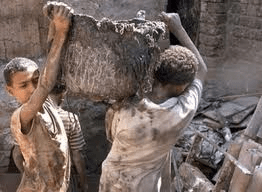 Whether they are sweating in the heat of stone quarries, working in the fields 16 hours a day, picking rags in the city streets, or hidden away as domestic servants, these children endure miserable and difficult lives. They earn little and are made to work more. They struggle to make enough to eat and perhaps to help feed their families as well. 1. Convention on the Rights of the Child, 1989. The International Program on the Elimination of Child Labour (IPEC) is a global program launched by the International Labour Organization in December, 1991. India was the first country to join it in 1992 when it signed a Memorandum of Understanding (MOU) with ILO. The MOU that expired on 31.12.1996 has been extended from time to time and has recently been extended till 31st December, 2006. The long-term objective of IPEC is to contribute to the effective abolition of child labour. (11) IPEC-India has, during the period 1992-2002, supported over 165 Action Programs. Apart from these laws mainly concerning children, there are a host of related welfare and criminal laws, which have beneficial provisions for the case, and protection of children. Even the laws relating to commerce, industry and trade have protective provisions beneficial to children. In 1979, Government formed the first committee called Gurupadswamy Committee to study the issue of child labour and to suggest measures to tackle it. The Committee examined the problem in detail and made some far-reaching recommendations. It observed that as long as poverty continued, it would be difficult to totally eliminate child labour and hence, any attempt to abolish it through legal recourse would not be a practical proposition. The Committee felt that in the circumstances, the only alternative left was to ban child labour in hazardous areas and to regulate and ameliorate the conditions of work in other areas. It recommended that a multiple policy approach was required in dealing with the problems of working children. Indian higher judiciary has played good role in protecting rights of children and specifically in the case of child labour. The Supreme Court of India, in its M.C. Mehta Vs State of Tamil Naidu (29) has given certain directions regarding the manner in which children working in the hazardous occupations are to be withdrawn from work and rehabilitated, and the manner in which the working conditions of children working in non-hazardous occupations are to be regulated and improved. Withdrawal of children working in hazardous industries and ensuring their education in appropriate institutions; Contribution of Rs.20,000 per child to be paid by the offending employers of children to a welfare fund to be established for this purpose; Employment to one adult member of the family of the child so withdrawn from work, and if that is not possible a contribution of Rs.5000 to the welfare fund to be made by the State Government; Financial assistance to the families of the children so withdrawn to be paid out of the interest earnings on the corpus of Rs.20,,000/25,000.00 deposited in the welfare fund as long as the child is actually sent to the schools; Regulating hours of work for children working in non-hazardous occupations so that their working hours do not exceed six hours per day and education for at least two hours is ensured. The entire expenditure on education is to be borne by the concerned employer; as a follow up of the directions of the Supreme Court, all the State Governments were sent detailed guidelines on December 26, 1996 indicating the manner in which the directions of the Supreme Court were to be implemented. A meeting of the NAECL was convened on 31st December 1996 to discuss the directions of the Supreme Court on child labour. It was decided in the meeting that the Ministry of Labour should immediately release funds to the State Governments so as to enable them to conduct surveys of working children before June 10, 1997. Child labour in India is a human right issue for the whole world. It is a serious and extensive problem, with many children under the age of fourteen working in carpet making factories, glass blowing units and making fireworks with bare little hands. According to the statistics given by Indian government there are 20 million child labourers in the country, while other agencies claim that it is 50 million. (31) According to the statistics given by ILO and other official agencies 73 million children between 10 to 14 years of age reemployed in economic activities all over the world. The figure translates into 13.2 of all children between 10to14 being subjected to child labour. (32) The child labour is prevalent at a large scale in the country. In Punjab it is found in hotels, restaurant, tea-stalls, rag collecting as domestic help in brick killen etc. for which the authorities ,parents ,educationist, police and employers or responsible. There is lack of implementations of child laws .Since politicians and other authorities exert pressure not to prosecute the child law violators. There are instances of bounded child labour are found in Punjab but the authorities ignore it and the various departments for the implementation of labour laws either lack funds or lack will to prosecute the child law defaulters and the laws remain merely on the paper for which the lack of control of population and increasing unemployment or the major causes and the politicians fear to tackle these problems in view of their vote banks. Suggestions – The Govt. should take proper effective steps to decrease the population and give the employment to the parents of child labour. Necessary practical steps should be taken to educate the children. Provided the necessary sufficient funds to the organizations working for the education and removal of child labour. There should be effective implementations of child protective laws. There should be necessary prosecution of child labour defaulters. The involvement of the religious leaders, trade unionist and non government organizations and to tackle the child labour by forming advisory committees on child labour on block level should be there. The authorities should not bend before the pressure of the politicians while tackling the problems of child labour. Conclusion- At present, inspite of policy of the government regarding removal of child labour. The various steps taken in this direction and the laws passed about it haven’t controlled the ongoing child labour. This is possible only with the co-operation of all sections of the society and the law enforcement agencies and by removing or minimizing the causes of child labour. The main thrust should be on controlling the population of the country, education of the children and providing sufficient funds for its removal from the gross domestic product of India. 19. Ibid; Art.21-A. (added by the 86th Amendment Act 2002). 20. Ibid; Art. 51A (k) (added by the 86th Amendment Act 2002). 23. Added by S.O. 1742 (E) dated 10th October 2006. 24. www.labour.nic.in; national child labour project. If we increase employment then no parents will force their children to become a labour. The above article is very good.The most important thing I agree with the sentences providing education to the children becuase,education teaches lot of good things to lead a good life, so the government should take proper actions in order to provide a good edcuation, to make future citizens. go back to your primary school days…..
how many of us were enthusiastic about waling up for school? how many of us finished homework first n they felt for playing without any interference of parents? how many of us really understood the meaning n importance of education at that age??? i m afraid that the answer is not many of us!!!!! n education……..i am a 16 year student………. i never found my textbooks or my teacher n d sad part not even my parents dreaming to make me less than any engineer or doctor????? my textbooks make me learn how earn money n how much to earn money to create a hold in society,…… n if there’s no 1 to sweep d roads…clean d waste on road…..n no 1 to work in field of maintenance wouldn’t we end up making d employment situation of our country much worse??????? plz don’t mind my English…i m working on it!!!!!!!! it should important to finish child labour form our country. 105 queries in 0.211 seconds.